With our December issue we have the pleasure of introducing our readers to Terrie Farley Moran, who wrote “Jake Says Hello.” In this segment of How’d That Happen, Terrie describes her fascination with the 1940s, the period in which her story takes place. Long before Tom Brokaw named them The Greatest Generation, even before Studs Terkel wrote his stunning oral histories: Hard Times: An Oral History of the Depression and The Good War: An Oral History of World War 11, the generation just before mine, those born in the 1920s, knew they lived in extraordinary times. And, at least in my family, they were a generation of story tellers. We grew up surrounded by tales of death, child labor, untended illness, prohibition, bootleg liquor, politicians, gangsters, cops, robbers, home evictions, hunger, religion and orphanages. When conversation turned to the war years, the men were strangely silent but the women talked about “the war effort.” After more than a decade of lean years, the war had brought jobs and money, but there was little in the way of things to buy. I’m sure the adults were relieved that the 1950s were extremely boring compared to the previous two decades which required great sacrifice. But to me as a child, those earlier decades reflected an idealistic luster on the adults who surrounded me. When I began writing short mystery fiction, I naturally gravitated to voices of an era that lived so comfortably in my head. By then I had stopped romanticizing the generation that came before and accepted that although they survived monumental times, people are, when all is said and done, burdened by their own human frailties: passion, greed, jealousy, envy, bitterness, and rage. In hindsight the greater history may have seemed grand, but the vices living inside the head or the heart often outweighed the potency of the times. And so in 2008 I came to write a short piece of noir fiction set in the early 1930s, “When A Bright Star Fades” about a man named Jake Hartly who paid far too great a price for his sins. “Bright Star” was published in the final issue of the webzine Hardluck Stories, and I remain ever grateful to Dave Zeltserman and Ed Gorman for their confidence in me and in Jake. I’ve always felt that there was more to Jake’s story. Although he had made peace with the lot he’d cast, I had not. “Jake Says Hello” introduces a man of many names, sometimes known as Wilson Grimes, who has lived a number of reckless lives. He and Jake Hartly are polar opposites in every possible way and yet they become entwined by chance and circumstance in the mid-1930s. Jake Hartly does a small a favor for Wilson Grimes. Over time, Grimes decides to return the favor in a way that would repel Jake and may shock some readers. He needs no justification but if he did, he would tell you that he trusted the vices of others to allow him to settle Jake’s score. 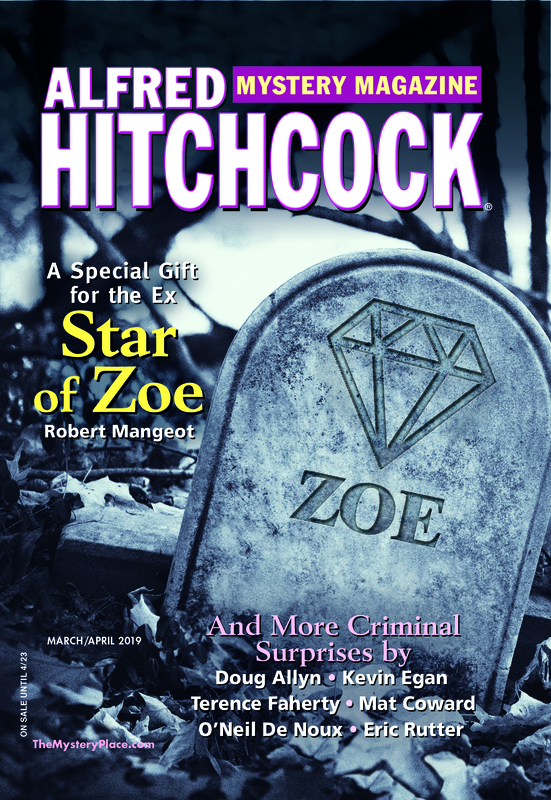 I am pleased that “Jake Says Hello” found a home in the December 2012 issue of Alfred Hitchcock Mystery Magazine. Jake Hartly’s saga is now complete. Can’t wait to read it, Terrie! Loved Bright Star. I find the whole stretch from 1910-1930’s fascinating. I’m an avid collector of Terrie’s stories and When A Bright Star Fades is fabulous, so I welcome a followup. Terrie, I envy you your storytelling family! Can’t wait to read the story, Terrie. Sound fabulous. I love the voices in your head, Terrie…with luck they’ll keep speaking to you for a long, long time, even if they are from a previous generation. “Jake Says Hello” is waiting for me on my Kindle. Looking forward to reading it. Jake sounds like a very interesting character. I look forward to reading your short story. The thirties was the era my mother grew up in and she had wonderful stories about it and the hard times her family endured. My only complaint about AHMM is that submissions aren’t accepted online! Terrie, captivating material because it speaks of another time. I admire the research that goes into such a story. I am fascinated with the adults in my early life as we lived through WWII and the “war effort” at home. I wrote a story for my family, which is about our first Thanksgiving Day after the war with all our men back home, our family together again, and eating foods rare to us. We, of course, were the lucky ones, and we never forgot it. Looking forward to reading about this fellow, Jake. Terrie, my memory of the forties is similar to yours. In addition to stories, my family was big on jokes, switching to Yiddish for the off-color ones so the kids wouldn’t understand. Your post reminded me of those years when families made their own entertainment. As you know, I loved “When a Bright Star Fades” and look forward to meeting Jake again. The December issue is now on my Nook. Interesting background, Terrie, and a period fascination I share. Can’t wait to read the story! Thanks so much for your kind words. I’m delighted that so many people took the time to comment. Each issue of AHMM brings fascinating mysteries to enhance our personal libraries with great reading.